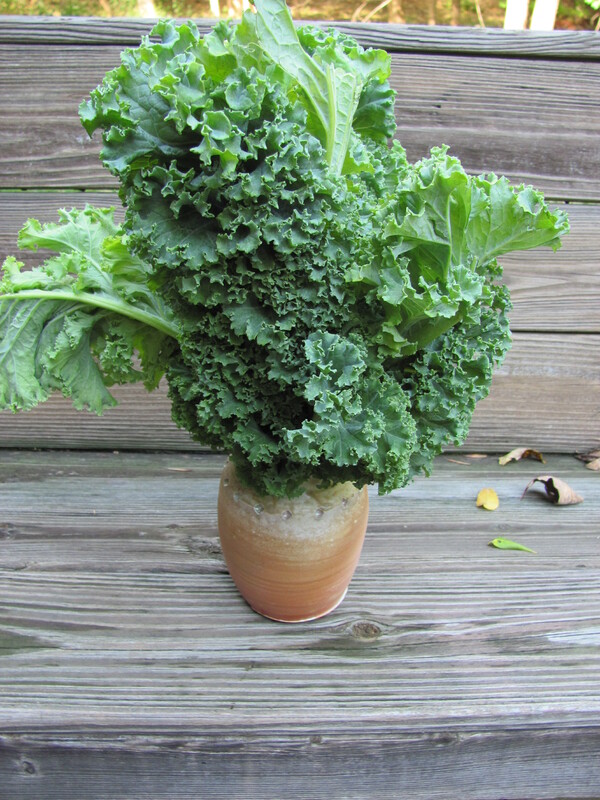 Go to a farm market or supermarket and buy a bunch of curly kale. 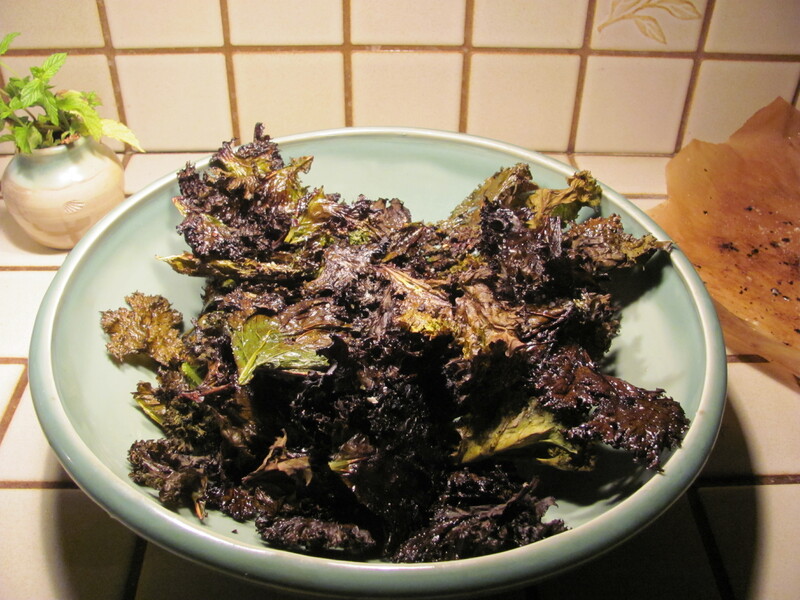 I also really like a kind of kale called black, lacinato or dinosaur which is not curly, but I’ve never tried making chips with it. When you’re ready to make chips, preheat the oven to 425°. 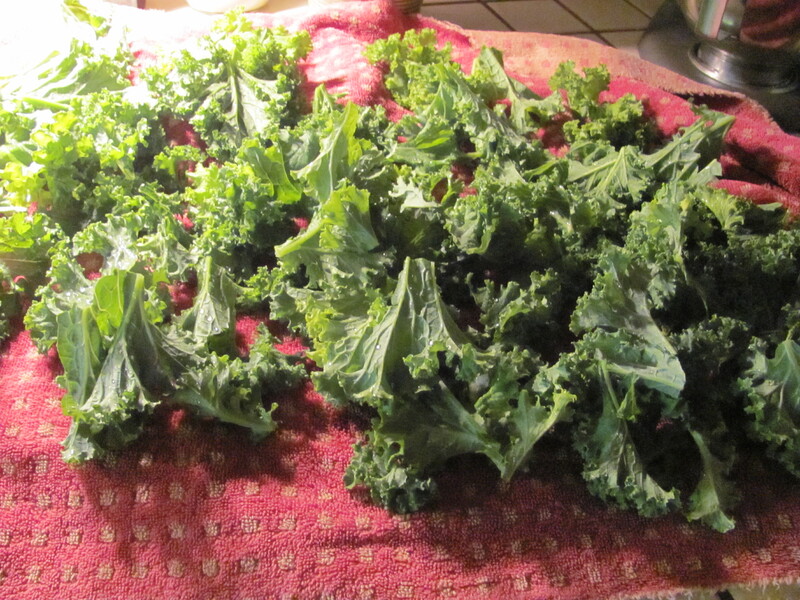 Now, stem and wash the kale. The best way to stem it is simply to pull the leafy parts off the stem. It’s fine if it breaks into small pieces because you really want the chips to fit in your mouth. 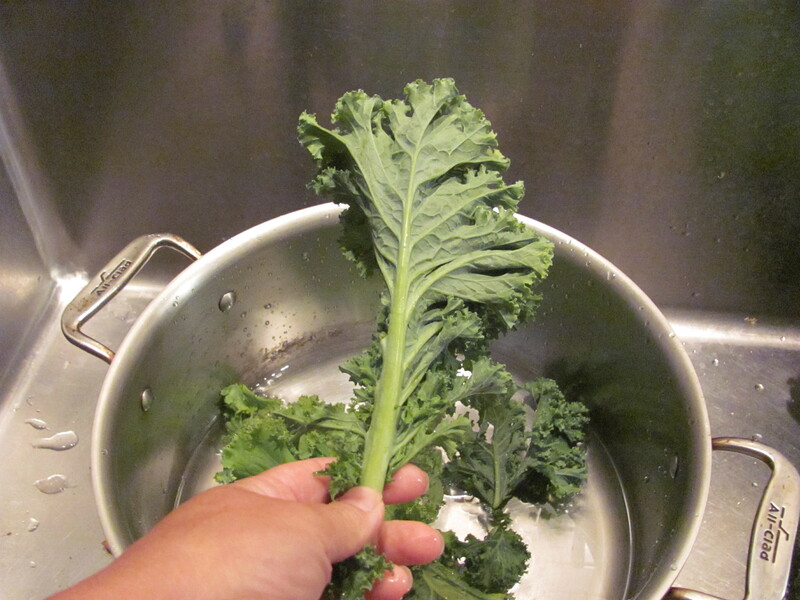 Now fill a big pot, bowl, or pail with cold water and give the pieces of kale a swim. Get a big towel and spread it out on the counter. 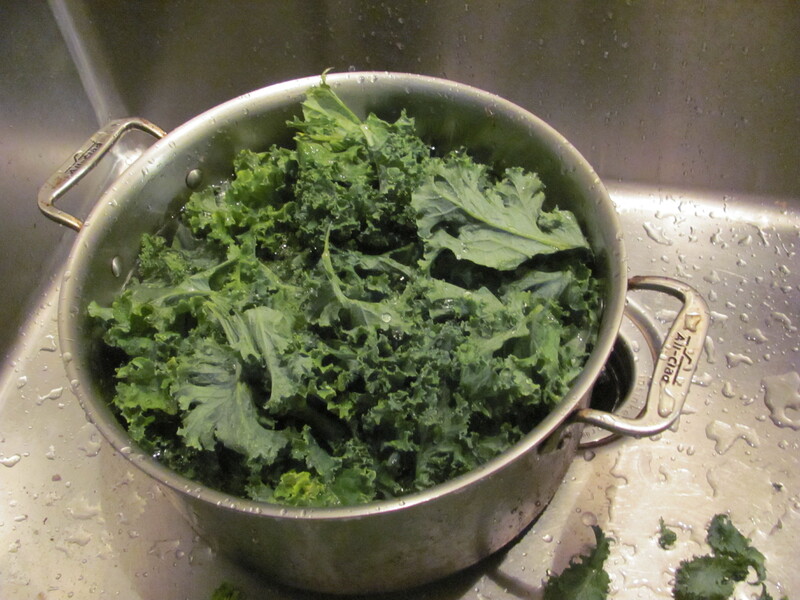 Pull the kale out of the water and drain it in a colander. This is the best way to wash any greens. You don’t want to pour the water like you would with pasta because if there’s dirt or sand, it will stay on top of the greens. If you pull the greens out, you leave dirt, sand or bugs in the water. Now, spread the clean kale out on the towel. Roll up the towel. You could store it that way for a while if you want. If you are going to store it more than a few hours, put the whole rolled up towel/kale bundle in a big plastic bag in the fridge. This is also a great way to store other greens, like salad greens. They stay fresh a long time this way. 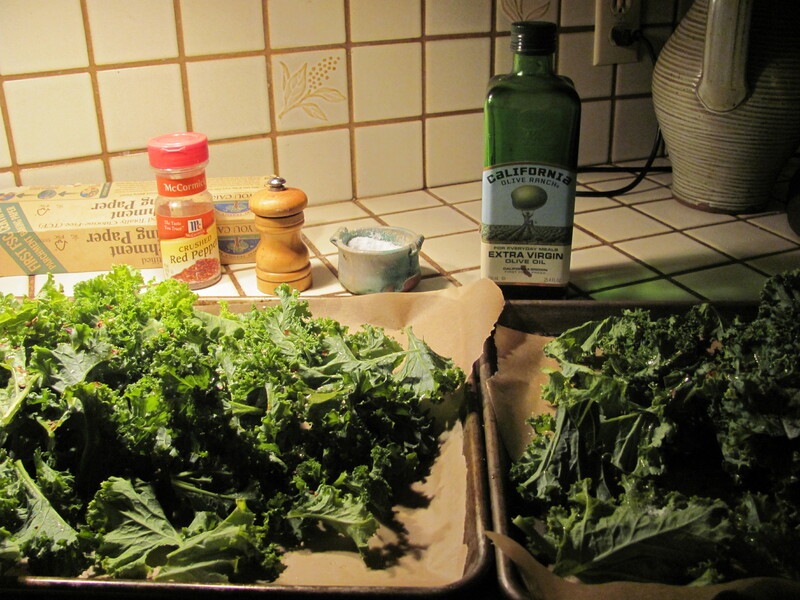 Put the kale on a couple of big, rimmed cookie sheets. I like to line them with parchment for easy cleaning, but this is totally optional. Drizzle with nice XV olive oil, plenty of salt (I like sea salt, kosher is also good, regular table salt is fine), fresh pepper and/or red pepper flakes. You could also add other herbs or spices or parm. Chili powder or cumin is good, Curry might be interesting, if you like curry. Garlic or onion powder would work. Don’t use fresh garlic or onion, they’re too wet. Toss everything really well and pop into preheated oven. Bake twenty minutes or so, tossing the kale around once or twice. You want them pretty crispy and dry. Munch as much as you want (I like them best right out of the oven) and store the rest in something airtight like a big zippy bag or rubbermaid container.